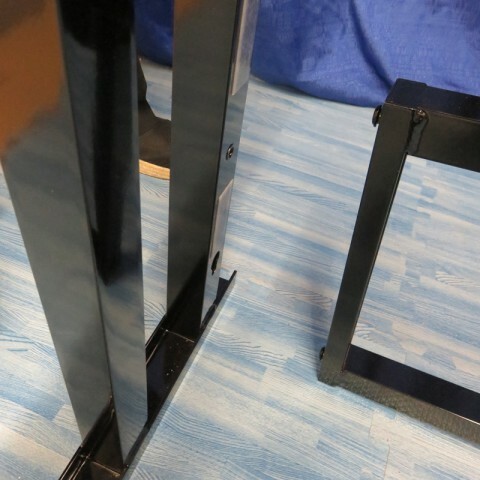 Slat Wall Floor Stand SSX Display This product allows you the freedom of quick set/up and take down. 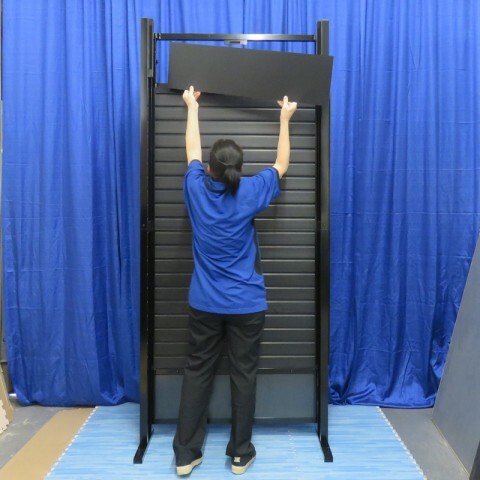 There is nothing easier or with the same quality as the Slat Wall Trade Show Panel Display by TADD Innovations. 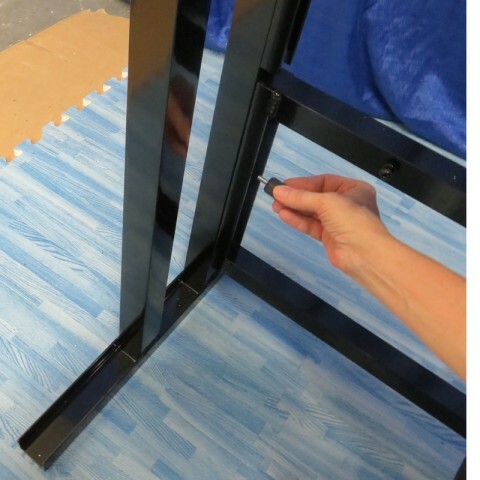 Unpack, follow color coded assembly instructions, place LED light on top with slide and lock bracket (not included) and you are ready to go! 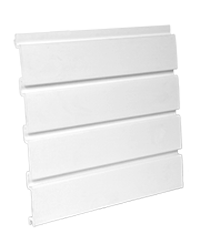 The SSX Floor Stand series is a strong well balanced slat wall panel system that sets up in minutes, perfect for a sales launch of products. Extremely portable and can endure countless set/ups and take downs. 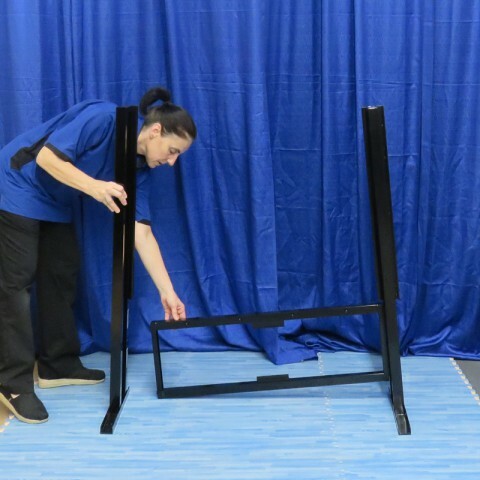 The SSX Slat wall floor stand series will save you time with just minutes to install and take down you can be packed and on the road fast once the venue is over. 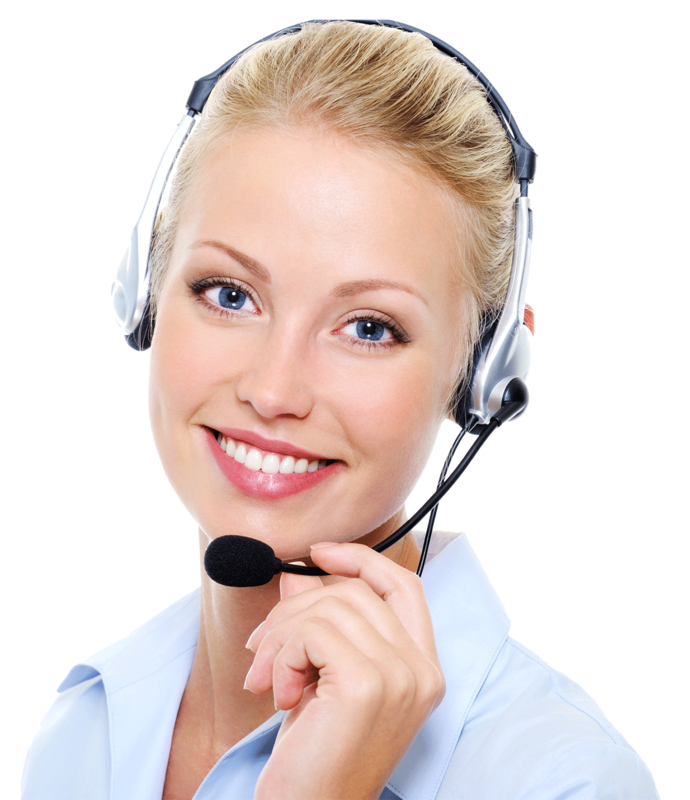 It is that easy and at a great economical price you cannot go wrong. 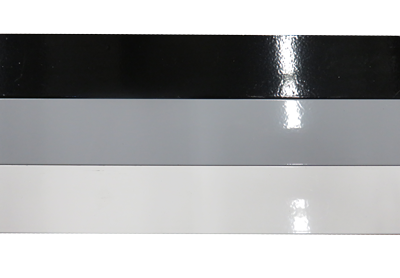 This freestanding aluminum frame has a channel for sliding slat wall panels on to each other, this builds a large slat wall display area, the Slat wall panel frames come in white, black or gray. 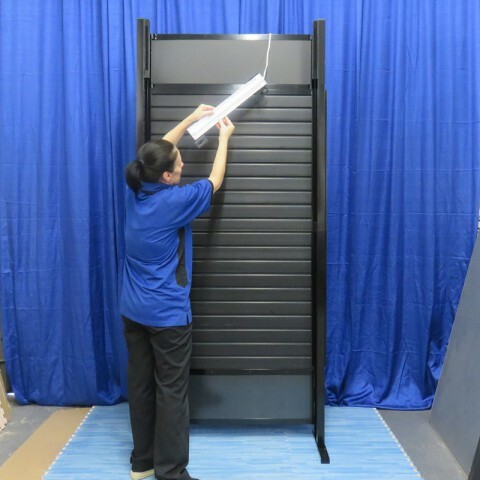 The slat walls have wire management in the event that you purchase LED shelves that work well with this product. Lighting is the key to all great looking trade show displays. 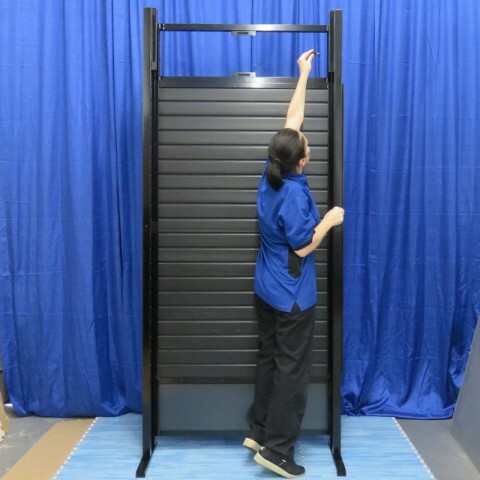 You can customize your slat wall panel display to whatever configuration you want, from all slat wall hooks to a combination of hooks and shelves. 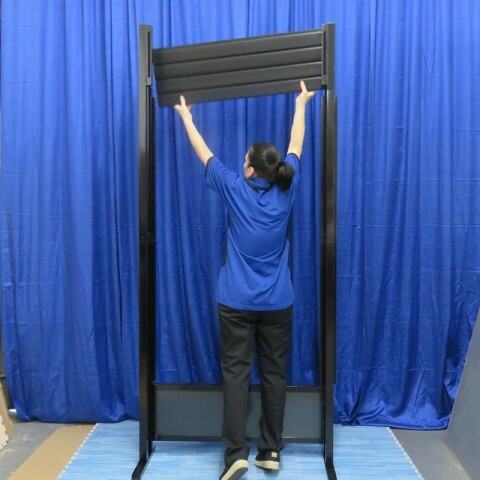 These portable trade show displays can stand alone or be used in tandem with any other trade show displays you may have. 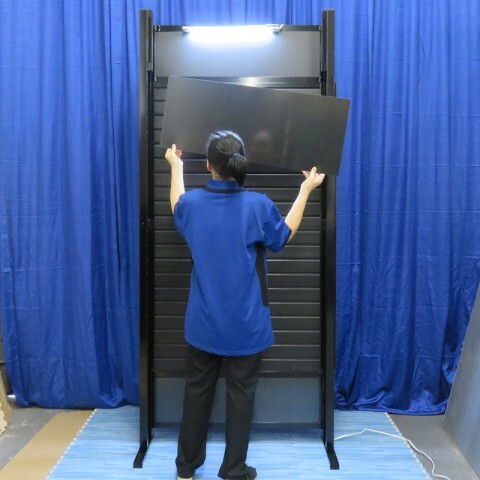 This trade show display will enhance your products and booth and lend to your brand. 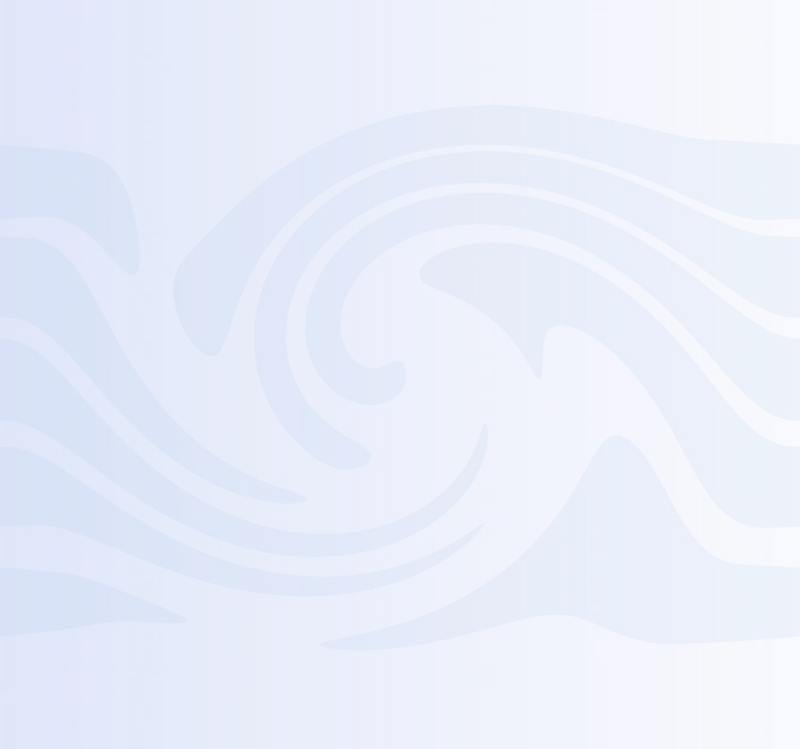 Many other uses to include, presentations, sales promotions, product launches and all pieces included and transports easily. 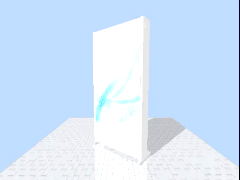 We have been creating products that you want for Decades. Everything you need to display your products in a organized and sophisticated manner at your next Trade Show! Set Up Made Simple! For more information and visual of parts please download description of parts PDF. 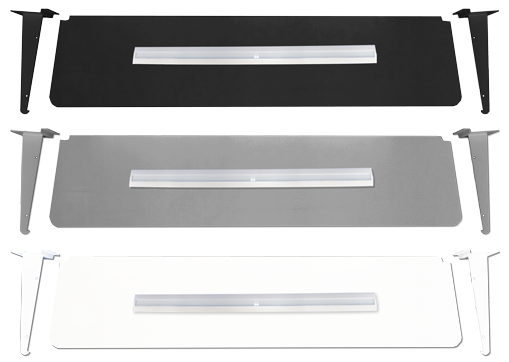 LED slide and lock light has 60 LED's, low voltage, super bright. 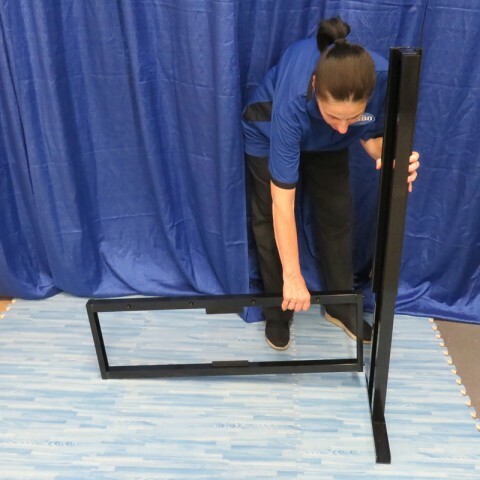 The slide and lock light comes with a easy plug in wire, wire length approximately 72". Easy on and off mounting bracket gets installed behind top sign shining down on slat wall. 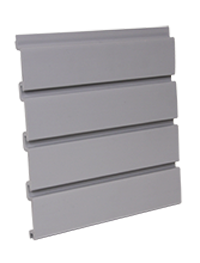 Slat wall shelves come in 3 colors Black, Gray and White. 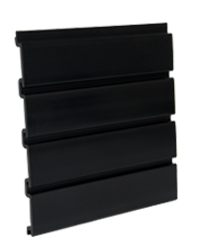 For a perfect fit our shelves are CNC routed from a light weight 1/2" birch, durable ABS vinyl covered in 3 colors, plastic color matching bumpers on the side for rugged trade show use. Inside Dimension: 19" x 16" x 50"
Outside Dimension: 21" x 17" x 53"
Printed on .125 inch PVC Styrene, dimensions are 9.5 inch Height x 44 inch Width, All signs have Velcro on back for easy placement onto slat wall display unit. 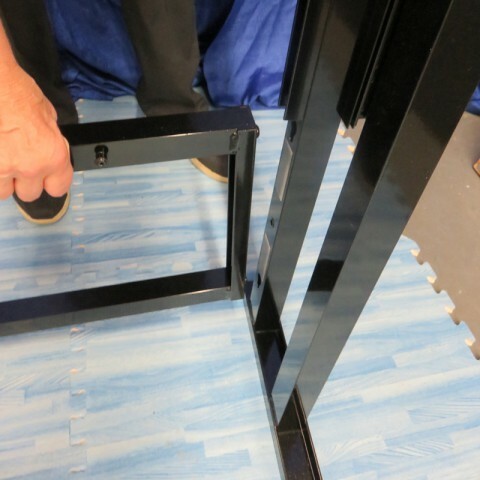 All SSX Series Slat wall floor stands can get a SEG fabric Graphic placed on the back of the Floor stand. 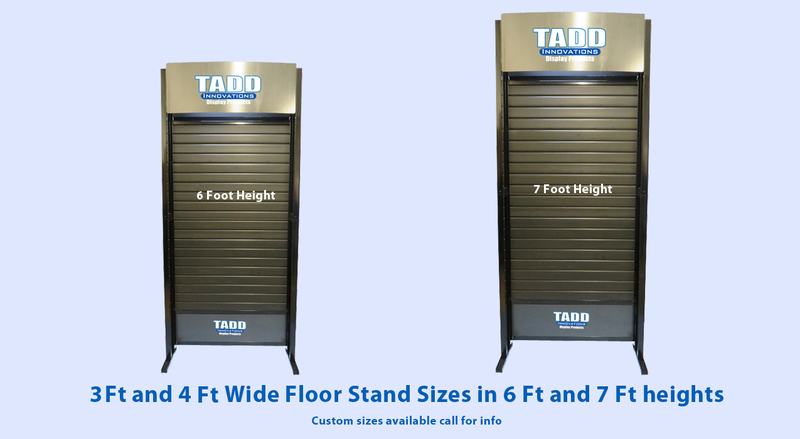 TADD Innovations Reserves the right to make minor design changes to ensure proper working use of products. 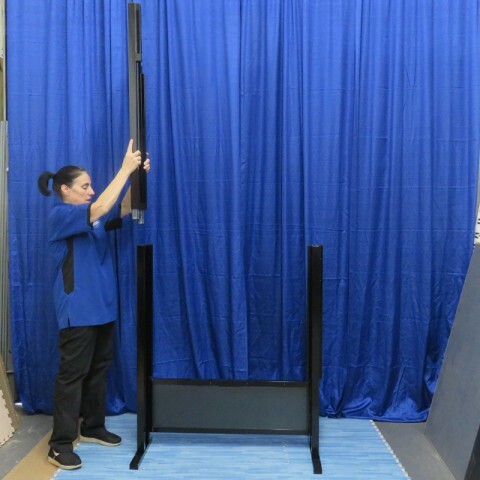 Please Call or Email and let's begin the process of building you a great and successful Trade Show Custom Floor Stand! 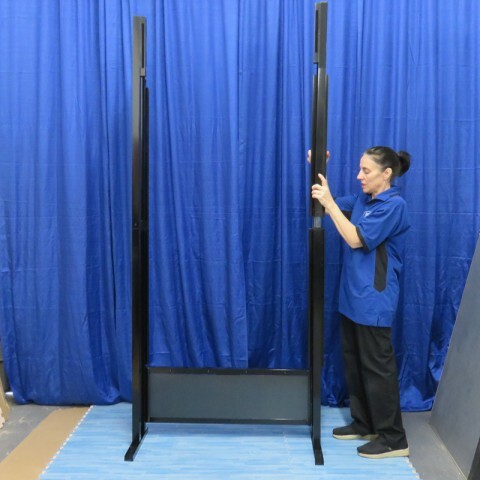 If you have questions about our floor stands just email sales@taddinnovations.com and we will get back to you ASAP or Call Us! 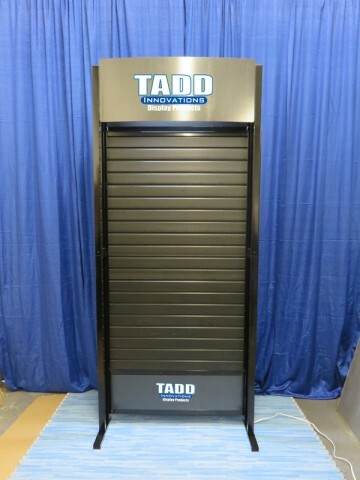 Email us at sales@taddinnovations.com for more information. 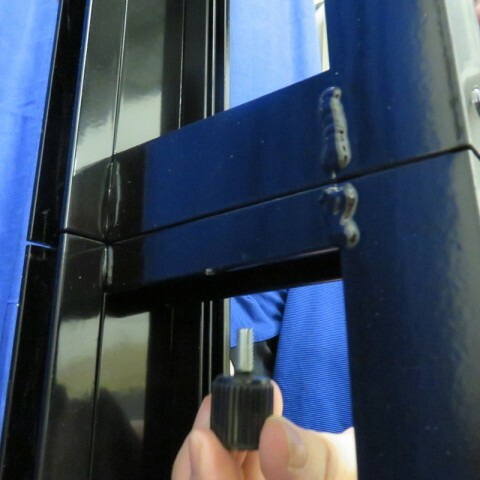 Our display products are Manufactured in America ...quality you can see and feel, guaranteed!